Throughout the previous two novels in his To Hell and Back series (The Damned Busters and Costume Not Included), Matthew Hughes speculated that the Bible was merely a piece of mutable fiction written (and rewritten) by the Almighty. It was, corroborates an angel up in Heaven, God’s way of working out the problems of morality; a way of figuring out what’s right or what’s wrong. Creation, he explained, was a continual work in progress. Having now come to the conclusion of this Hell-ish trilogy, we have a sneaking suspicion that Hughes wasn’t really talking about God and the Bible. He was actually talking about himself the whole time. That’s because Hughes has completely lost interest, dropped, or marginalized many of the characters from his earlier books. Letitia Arnstruther, Billy Lee Hardacre, Poppy Paxton, Warren Theophilus Paxton, Mayor Greely…even Jesus of Nazareth! There are so many discarded characters laying in the margins of this series it makes our head spin. As it turns out, it was Hughes, and not God, who was prone to cutting dangling plot threads, changing the story’s direction capriciously, and abandoning characters without a second thought. Hell to Pay isn’t a total throwaway, however. Despite his haphazard plotting and his disregard for certain members of the cast, there was one thing Hughes had to do before he cashed his final check. He had to bring Heaven and Hell together (with a little help from a superhero named the Actionary) and create a brand new universe. Easy peasy lemon squeezy! Thankfully, Hughes is a clever writer (when he wants to be). There’s no way we can excuse the sloppiness of this effort, but Hughes is certainly willing to entertain the reader with all sorts of crazy diversions. For example, he reanimates both Barabbas and Simon Magus for great mischief and he introduces a tribe of clattering dinosaurians called the Chikkichakk. It all adds up to a loud and unruly conclusion. But when you write a superhero series that includes dinosaurs, angels, demons, a magician, a televangelist, one Satan, and two Sons of God, things tend to get a little messy around the edges. 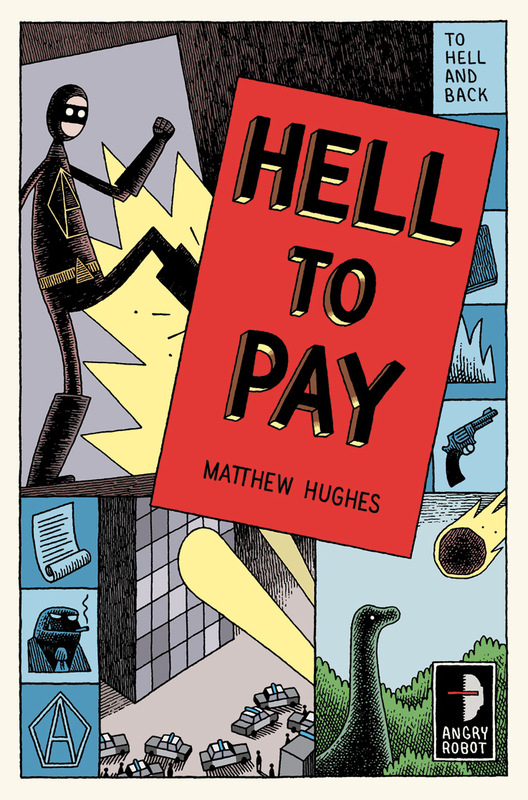 This entry was posted in Published in 2013 and tagged Hell to Pay, Matthew Hughes. Bookmark the permalink.